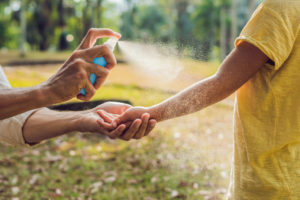 Who doesn’t love the warm weather, playing outdoors with your kids, camping trips, barbeques, vacations with your family and days at the park? We all do, and so do TICKS! Last summer we packed up the kids and went out east for a long weekend. We had great weather and really enjoyed ourselves. Until I noticed a black spot on my son’s blond head. Yup, he had a tick. Attached and engorged. A pit formed in my stomach as I removed it with my eyebrow tweezers. Thankfully, my son was fine. I wouldn’t say our vacation was ruined, but who needs the stress?! It was scary to see it on my little guy, even for myself who has experience in diagnosing and treating Lyme disease. So, hopefully, this post will shed some light on ticks and Lyme, as it is all too common in our area. Ticks are pesky insects that transmit disease. There are many different species of ticks, all of which spread different diseases. 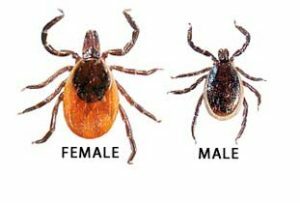 Because of our location in the northeast, this post will focus on the Blacklegged tick, or deer tick, (Ixodes Scapularis) and the Lyme Disease that it transmits. ranges in size from a poppy seed to a sesame seed, depending on its stage of life. is found all along the eastern coast in tall grasses, brush, and wooded areas. Avoid places where ticks are found; stay inside trails, avoid brush and leaf litter. While camping/hiking apply permethrin to boots, clothing, and gear. Check yourself/your child’s body, paying special attention to groin, armpits, scalp, belly button, around the waist, in/around ears. Don’t just check exposed areas! They climb on anywhere, but they tend to crawl up to these hidden places to attach themselves. If you find a tick loose in clothing, flush it down the toilet to get rid of it. If you do find an attached tick, remove it right away! The good news is, in most cases, the tick must be attached for 36 to 48 hours before the disease bacterium can be transmitted. Fine tipped tweezers are all you need to grip the tick firmly and as close to the skin as possible. Pull upward with steady, even pressure. Don’t crush a tick with your bare hands! Get rid of it by flushing it! Testing of ticks is generally not recommended. Tick testing labs are not held to the same high standards of quality control as clinical diagnostic labs. Results of tick testing should not be used for treatment decisions. Positive results do not necessarily mean you have been infected. Negative results may give false reassurance. If you have been infected, your symptoms may present before the test results are available. If you find an engorged tick or one that has been attached for an unknown period of time, don’t panic! What you should do is call your doctor right away to see if you’re a candidate for antibiotic prophylaxis and keep a close eye out for a rash and flu-like symptoms. If you or your child experience any of these symptoms, you should be seen by your physician right away. Lyme Disease is treated with antibiotics. Fortunately, recovery is usually rapid and complete for those who are treated early and with appropriate antibiotics. Unfortunately, there is not a simple blood test to diagnose Lyme immediately. The lab testing, we use is accurate, but not until 4-6 weeks after a tick bite. For this reason, prevention, early tick removal and a close watch for early symptoms are extremely important in battling Lyme disease. The CDC’s website has a ton of sound advice on ticks, prevention and the many diseases that ticks transmit. It’s definitely worth checking out to learn more!